Division of Gastroenterology, Department of Medicine, Soonchunhyang University College of Medicine, 31 Suncheonhyang 6-gil, Dongnam-gu, Cheonan 31151, Korea. E-mail address:yoonho7575@naver.com (Y. Jung). Received: October 16, 2017; Accepted: October 17, 2017; Published online: October 31, 2017. Digestive endoscopy has evolved from primary diagnosis to extensive therapeutic approaches for the management of gastrointestinal diseases. Increased health awareness has encouraged more people to undergo endoscopic examinations. For these reasons, the absolute number of iatrogenic perforations is likely to increase. Because of the very low incidence of perforations, clinicians are not always prepared or experienced in cases of unexpectedly encountered perforations during diagnostic or therapeutic endoscopic procedures. In this study, the proper approach to handling perforations is discussed including selection of endoscopic devices, endoscopic closure procedures, and management of patients after a perforation occurs in the gastrointestinal tract. Upper gastrointestinal (GI) tract perforations occur due to various spontaneous (peptic ulcer, Boerhaave’s syndrome) and iatrogenic causes (diagnostic endoscopy, foreign bodies, balloon dilatation, endoscopic mucosal resection [EMR], endoscopic submucosal dissection [ESD], and endoscopic retrograde cholangiopancreatography). Perforation of a peptic ulcer is now less frequent because of the availability of adequate medical therapies for peptic ulcer disease. Most cases of iatrogenic perforation occur during therapeutic endoscopic procedures, particularly during EMR and ESD for treating superficial cancers. Although the incidence of iatrogenic perforation is very low, iatrogenic perforation is associated with significant morbidity, mortality, and potential fatality. Therefore, iatrogenic perforations that occur during endoscopic procedures are generally managed surgically.1,2 However, the standard treatment strategy has changed with the development of endoscopic devices and the results from animal and clinical studies. With the introduction of metallic endoclips, cases of successful endoscopic treatment using endoclips in the GI tract have been described since 1993.3 We must determine the proper endoscopic devices and techniques, as well as use evidence-based approaches to manage perforations successfully. An ingested foreign body can also cause a GI tract perforation. In 1% of cases, an ingested sharp foreign body causes complications such as acute abdomen due to an intestinal perforation,9,10 occasionally leading to serious complications and even death. The duration of an ingested foreign body in the GI tract and the risk of perforation or obstruction are associated with the anatomy and structure of the GI tract. Iatrogenic perforations at an early stage are associated with unusual abdominal pain with distension, chest pain, subcutaneous emphysema, or shortness of breath, while those at a later stage are associated with more severe symptoms or signs, such as a systemic inflammatory response, hypotension, and mental confusion.16 However, some patients may be asymptomatic following GI tract perforation. If a perforation is suspected, it should be confirmed by diagnostic tests as well as by symptoms. Plain radiography has been the first modality of choice for patients with suspected GI tract perforations. Extraluminal air may be free in the peritoneal cavity, retroperitoneal space, mesentery, or ligaments of organs. The reported sensitivity for detecting extraluminal air on plain radiography is 50% to 70%. A water-soluble iodinated contrast examination may be indicated if a gut perforation is not seen on plain radiography.17,18 Some studies have demonstrated that ultrasonography has greater accuracy compared with x-rays (sensitivity 93% vs 79%), and that ultrasonography is a useful diagnostic modality when x-rays do not reveal a pneumoperitoneum in patients with a suspected perforation.19,20 Computed tomography (CT) has higher accuracy in revealing small quantities of free air, fluid, or empyema in the mediastinum and/or pleural or peritoneal cavity, and it provides better definition of adjacent structures.21 The major advantage of CT is that it can correctly depict the actual site of perforation, compared with radiography and ultrasonography. Air insufflation should be turned off first when an iatrogenic perforation occur during an endoscopic procedure performed by a novice endoscopist, and an expert should take charge as soon as possible. Intestinal fluid should be suctioned out, or the position of the organ should be altered to prevent a leak. If an uncontrollable GI perforation occurs in a primary clinic, the patient should be referred to a tertiary hospital as soon as possible. The expert endoscopist should decide whether to perform observation only or endoscopic closure and surgical treatment. Endoscopic closure should be considered depending on the type and size of the perforation, endoscopist’s expertise, and available devices at the center. In addition, luminal contents can be diverted, and a tension pneumoperitoneum or tension pneumothorax should be decompressed. A clean GI lumen and adequate expertise of the endoscopist are prerequisites for successful endoscopic closure of iatrogenic perforations.16 The clinical stability of the patient, including peritonitis symptoms and underlying diseases, should be considered before deciding the treatment modality. The expert endoscopist should switch to carbon dioxide endoscopic insufflation to attempt endoscopic closure and should not insist on using only a single method. The expert should consider different devices according to the size and location of the iatrogenic perforation. Hospitalization is nearly always required for iatrogenic perforation, and the patient should be made NPO (nothing by mouth). Nasogastric tubes should be used to divert GI fluid, as appropriate. Broad-spectrum intravenous antibiotics are administered intravenously. Close clinical multidisciplinary monitoring (by endoscopists, surgeons, and intensive care physicians) is required. A variety of devices can be used to perform successful endoscopic closure of a GI perforation. Important tips for applying TTSCs for large perforations are as follows. (1) Switch CO2 insufflation on and insufflate minimally with gas. (2) Fixate the clip arms on the tissue surrounding the perforation. (3) Slowly apply the endoclips using a proper approximation to prevent slippage on the grasped tissue. (4) Approach from the proximal to the distal part of the perforation, especially for large-sized perforations. (5) Remove an incorrectly applied clip, if necessary. (6) Apply hemoclips until the perforation is definitely sealed. Transparent caps can help decrease the amount of insufflated gas that enters the abdominal cavity and sometimes help approach a difficult position, anchor the endoscope, or apply a clip (Fig. 1). Clip placement may be difficult because of the location of the perforation. In such cases, the recently described band ligation technique can be a useful alternative.23 However, because of the limited size of the endoscopic cap, only small perforations can be sealed. Important tips for applying the band ligation technique are to maintain adequate distance between the perforation site and the endoscopic banding cap so that the surrounding tissues, including the perforation site, are sufficiently sucked into the banding cap. The surrounding perforation tissues are suctioned sufficiently into the banding cap by continuous suction until a ‘pink or red out sign’ is observed before deploying the band (Fig. 2). The Over-The-Scope Clip (OTSC) system (Twin Grasper; Ovesco Endoscopy AG, Tübingen, Germany) is easy to apply, and it was designed to create a full-thickness closure by using teeth arranged in the shape of a bear trap. The OTSC system is the most evaluated technique for 10- to 30-mm-sized perforations, and its efficacy in managing postoperative leaks or fistulas has been demonstrated in clinical studies. Four relevant studies have highlighted the efficacy of OTSCs with a total success rate of greater than 95% (22 patients).24–27 The closure process for an OTSC is as follows.28 (1) The center of one of the lateral edges of the perforation is grasped using one arm of the OTSC Twin Grasper. (2) All layers of the GI wall, including the serosa and center of the opposing edge of the perforation, are grasped using the second arm of the OTSC Twin Grasper to bring the two sides of the perforation into complete contact. (3) The reapposed tissue is pulled into the OTSC cap at the tip of the endoscope. (4) Sufficient suction is maintained to aspirate the tissue surrounding the perforation into the cap. (5) The OTSC is released by turning a wheel on the shaft of the endoscope, similar to the endoscopic band ligation method (Fig. 3). The TTSC closure process using the endoloop technique is as follows. (1) Use a double-channel endoscope to place an endoloop through one channel around the perforated tissue. (2) Hemoclip the endoloop and surrounding perforated tissues several times through the other channel. (3) Tighten the endoloop for closure or to reduce the defect (Fig. 4). The indications for placing a self-expendable metal stents (SEMS) for benign upper GI leaks or perforations include (1) a fistula after bariatric surgery, (2) other postoperative fistulae, (3) Boerhaave’s syndrome, (4) iatrogenic perforations, and (5) other perforations.30,31 Stents may be a better option for perforations or fistulas > 2 cm and for defects with everted edges in the esophagus.27 A perforation in the GI tract with a stricture is a good indication for the endoscopic closure method. There may be differences in endoscopic closure methods depending on the size of the perforation and its location in the GI tract. However, regardless of the location in the GI tact, the TTSC or band ligation method can be used to close a perforation ≤ 1 cm in size, the OTSC or TTSC method for perforations 1 to 2 cm, and the endoloop with clips or OTSC method for perforations 2 to 3 cm. Surgery should be considered for perforations > 3 cm. In addition, careful observation to ensure that the perforation site is completely sealed after closure is important (Fig. 5). Successful endoscopic closure of acute iatrogenic perforations in the GI tract can reduce medical costs and hospital stays and prevent the need for surgical intervention for the patient. We must determine the proper endoscopic devices, techniques, and approach strategies to manage a perforation successfully. Fig. 1. (A) A 2 cm lateral spreading tumor located in the ascending colon. (B) Perforation occurs after endoscopic resection. (C) Successful suturing of the perforation using a hemoclip. Fig. 5. Endoscopic closure methods according to perforation size. OTSC, Over-The-Scope Clip. Bell, RC, Van Stiegmann, G, Goff, J, Reveille, M, Norton, L, and Pearlman, NW (1991). Decision for surgical management of perforation following endoscopic sphincterotomy. Am Surg. 57, 237-40. Chaudhary, A, and Aranya, RC (1996). Surgery in perforation after endoscopic sphincterotomy: sooner, later or not at all?. Ann R Coll Surg Engl. 78, 206-8. Binmoeller, KF, Grimm, H, and Soehendra, N (1993). Endoscopic closure of a perforation using metallic clips after snare excision of a gastric leiomyoma. Gastrointest Endosc. 39, 172-4. Tsao, GJ, and Damrose, EJ (2010). Complications of esophagoscopy in an academic training program. Otolaryngol Head Neck Surg. 142, 500-4. Sun, F, Yuan, P, Chen, T, and Hu, J (2014). Efficacy and complication of endoscopic submucosal dissection for superficial esophageal carcinoma: a systematic review and meta-analysis. J Cardiothorac Surg. 9, 78. Minami, S, Gotoda, T, Ono, H, Oda, I, and Hamanaka, H (2006). Complete endoscopic closure of gastric perforation induced by endoscopic resection of early gastric cancer using endoclips can prevent surgery (with video). Gastrointest Endosc. 63, 596-601. Yokoi, C, Gotoda, T, Hamanaka, H, and Oda, I (2006). Endoscopic submucosal dissection allows curative resection of locally recurrent early gastric cancer after prior endoscopic mucosal resection. Gastrointest Endosc. 64, 212-8. Kojima, T, Parra-Blanco, A, Takahashi, H, and Fujita, R (1998). Outcome of endoscopic mucosal resection for early gastric cancer: review of the Japanese literature. Gastrointest Endosc. 48, 550-4. Pinero Madrona, A, Fernández Hernández, JA, Carrasco Prats, M, Riquelme Riquelme, J, and Parrila Paricio, P (2000). Intestinal perforation by foreign bodies. Eur J Surg. 166, 307-9. Velitchkov, NG, Grigorov, GI, Losanoff, JE, and Kjossev, KT (1996). Ingested foreign bodies of the gastrointestinal tract: retrospective analysis of 542 cases. World J Surg. 20, 1001-5. Vijaysadan, V, Perez, M, and Kuo, D (2006). Revisiting swallowed troubles: intestinal complications caused by two magnets--a case report, review and proposed revision to the algorithm for the management of foreign body ingestion. J Am Board Fam Med. 19, 511-6. Okano, A, Hajiro, K, Takakuwa, H, Nishio, A, and Matsushita, M (2003). Predictors of bleeding after endoscopic mucosal resection of gastric tumors. Gastrointest Endosc. 57, 687-90. Imagawa, A, Okada, H, Kawahara, Y, Takenaka, R, Kato, J, and Kawamoto, H (2006). Endoscopic submucosal dissection for early gastric cancer: results and degrees of technical difficulty as well as success. Endoscopy. 38, 987-90. Kakushima, N, Fujishiro, M, Kodashima, S, Muraki, Y, Tateishi, A, and Omata, M (2006). A learning curve for endoscopic submucosal dissection of gastric epithelial neoplasms. Endoscopy. 38, 991-5. Lee, IL, Wu, CS, Tung, SY, Lin, PY, Shen, CH, and Wei, KL (2008). Endoscopic submucosal dissection for early gastric cancers: experience from a new endoscopic center in Taiwan. J Clin Gastroenterol. 42, 42-7. Paspatis, GA, Dumonceau, JM, Barthet, M, Meisner, S, Repici, A, and Saunders, BP (2014). Diagnosis and management of iatrogenic endoscopic perforations: European Society of Gastrointestinal Endoscopy (ESGE) Position Statement. Endoscopy. 46, 693-711. Furukawa, A, Sakoda, M, Yamasaki, M, Kono, N, Tanaka, T, and Nitta, N (2005). Gastrointestinal tract perforation: CT diagnosis of presence, site, and cause. Abdom Imaging. 30, 524-34. Ghahremani, GG (1993). Radiologic evaluation of suspected gastrointestinal perforations. Radiol Clin North Am. 31, 1219-34. Chang-Chien, CS, Lin, HH, Yen, CL, Lee, CM, and Lin, SM (1989). Sonographic demonstration of free air in perforated peptic ulcers: comparison of sonography with radiography. J Clin Ultrasound. 17, 95-100. Chadha, D, Kedar, RP, and Malde, HM (1993). Sonographic detection of pneumoperitoneum: an experimental and clinical study. Australas Radiol. 37, 182-5. Paspatis, GA, Vardas, E, Theodoropoulou, A, Manolaraki, MM, Charoniti, I, and Papanikolaou, N (2008). Complications of colonoscopy in a large public county hospital in Greece. A 10-year study. Dig Liver Dis. 40, 951-7. Daram, SR, Tang, SJ, Wu, R, and To, SD (2013). Benchtop testing and comparisons among three types of through-the-scope endoscopic clipping devices. Surg Endosc. 27, 1521-9. Han, JH, Lee, TH, Jung, Y, Lee, SH, Kim, H, and Han, HS (2013). Rescue endoscopic band ligation of iatrogenic gastric perforations following failed endoclip closure. World J Gastroenterol. 19, 955-9. Surace, M, Mercky, P, Demarquay, JF, Gonzalez, JM, Dumas, R, and Ah-Soune, P (2011). Endoscopic management of GI fistulae with the over-the-scope clip system (with video). Gastrointest Endosc. 74, 1416-9.
von Renteln, D, Denzer, UW, Schachschal, G, Anders, M, Groth, S, and Rösch, T (2010). Endoscopic closure of GI fistulae by using an over-the-scope clip (with videos). Gastrointest Endosc. 72, 1289-96. Parodi, A, Repici, A, Pedroni, A, Blanchi, S, and Conio, M (2010). 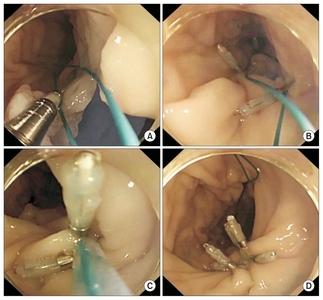 Endoscopic management of GI perforations with a new over-the-scope clip device (with videos). Gastrointest Endosc. 72, 881-6. Manta, R, Manno, M, Bertani, H, Barbera, C, Pigò, F, and Mirante, V (2011). Endoscopic treatment of gastrointestinal fistulas using an over-the-scope clip (OTSC) device: case series from a tertiary referral center. Endoscopy. 43, 545-8. Matthes, K, Jung, Y, Kato, M, Gromski, MA, and Chuttani, R (2011). Efficacy of full-thickness GI perforation closure with a novel over-the-scope clip application device: an animal study. Gastrointest Endosc. 74, 1369-75. Martínek, J, Ryska, O, Tuckova, I, Filípková, T, Doležel, R, and Juhas, S (2013). Comparing over-the-scope clip versus endoloop and clips (KING closure) for access site closure: a randomized experimental study. Surg Endosc. 27, 1203-10. Swinnen, J, Eisendrath, P, Rigaux, J, Kahegeshe, L, Lemmers, A, and Le Moine, O (2011). Self-expandable metal stents for the treatment of benign upper GI leaks and perforations. Gastrointest Endosc. 73, 890-9. Raju, GS (2009). Endoscopic closure of gastrointestinal leaks. Am J Gastroenterol. 104, 1315-20.